Destini Perkins talks to a fellow member of BSU. She holds BSU meetings every Thursday during lunch in Ms. Salah’s room. Destini Perkins is not only shooting hoops with her team and studying for her classes but she also mentors and encourages students on campus to be themselves and know they have a safe space that embraces their culture during the Black Student Union meetings. Perkins is a student, friend, athlete and BSU’s president. She is a leader to her peers, she helps students feel heard, have a safe space for everyone to be loved and to be themselves. 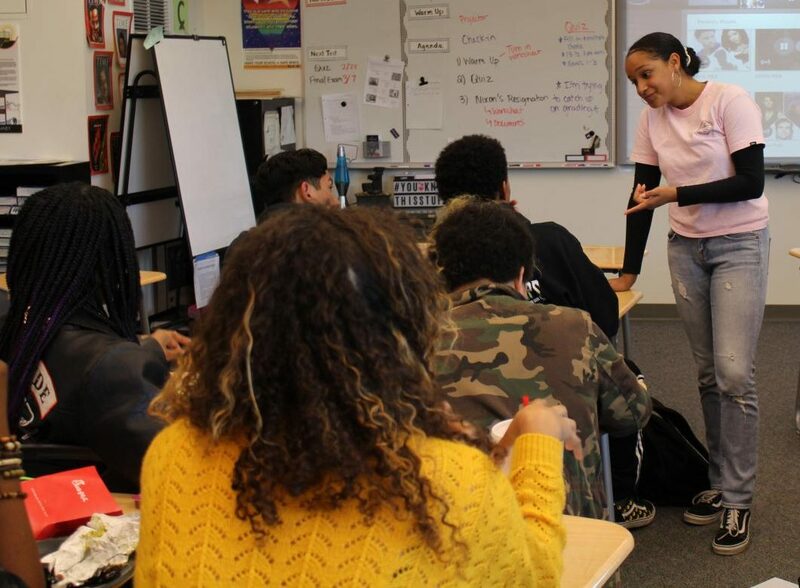 She gives students on campus a club to talk, make friends and learn life lessons that helps give students the strength to be whoever they want to be whatever race they are. She holds BSU meetings every Thursday during lunch in Ms. Salah’s room. She loves seeing new faces and getting the opportunity to connect and bring their culture into the school. Perkins is passionate about what she believes in, and even though being president is a big responsibility, she thinks the impact made on the students is amazing and loves seeing the giant smiles when walking into the meetings. Cavaughn Higgs is vice president of BSU. He loves the ideas and activities that Perkins comes up with for the meetings. Higgs has seen Perkins grow from when she first started junior year till now. “Destini is an awesome friend, she’s also a great leader especially within BSU— also just in the Sage Creek community,” Higgs said. 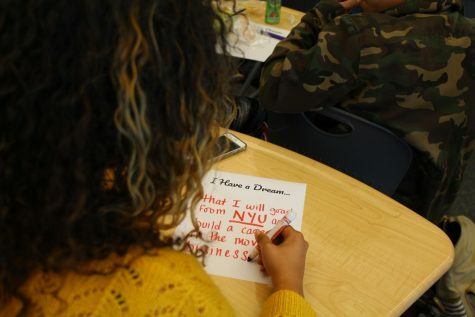 A BSU member fills out an “I Have a Dream” paper at a meeting. BSU gives students the chance to ask questions about events that others might not understand. Perkins thinks that everyone deserves a safe space on campus which is why she loves that she gets to be president to a club that does just that. BSU gives students the chance to ask questions and not feel embarrassed or talk about events that others might not understand. “I just love talking to all ages of people and meeting all the freshman that could one day be BSU president,” Perkins said, “ Being a mentor for the kids when they want to talk [or] ask me questions and open up to me… I love being that person,” Perkins said. Her dedication and hard work really makes it a place for all people on campus to go to talk or share. It is the place you go to have a good time learning things about each other and personal experiences, ways to improve and be strong. “Destini is always working hard. She always has so much on her plate but is really good at juggling it all to make sure she always prepared for our club,” Higgs said. Dorsey-McQueen feels like Perkins’s invitation to BSU at the beginning of the year really spoke to him. During the meetings, he has made new friends, and Perkins’s teachings and atmosphere helps to make the students in BSU feel like family. Perkins won’t stop fighting for what she believes in, she is a role model to so many. She gives students a place to learn about their culture and connect with the people around them. She gives them a safe place on campus to say how they feel and there is nothing but love and friendships in her horizon.